NAFSO iinitiated a dialogue between kind heaterd individuals and the humantarian organizations for this and deeply discussed to stop these dots of teares working together as a human chain as those are very olders than 25 years by now. The first meeting took place at the Center of " Service Sivil Internation" convening community helath forum and the leaders from various organizations and 50 voluntters represented from various sectors and aosme of leftist also were present at the occation including Mr. Wasudewa Nanayakkara and Mr. Raja Kollure. Dr. Winya Ariyarathne was the key speaker at the time with the help of Vasudeva Nanayakkara. 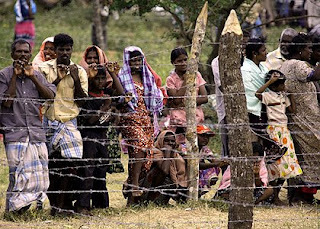 this meeting mainly focused an immediate action for internal displaced people at the war in Sri Lanka pragmetic solution for tamil community. All the participants agreed to collect goods volunteerly and hand over those those goods to SARVODAYA collecting center. as a result of this meeting and the other main thig was all participants agreed to content of this and Mr. Vasudewa took the responsibility to prepare a memoradom and circulate it amoung others including issues and alternative solutions. following this meeting an another meeting was conducted at NAFSO National Office permise in Negombo. with 16 different people representing various kinds of organizations. this also based on the main fact here mentioned above and the next meeting will be held in Negombo at tye same place for deep discussion on the same matter and a wider net workn will be built in the future in regard to this matter .